Nick Anderson is a former RAF Phantom jet fighter pilot. We discuss flying in the Cold War and in detail how the RAF would have responded to a nuclear attack. 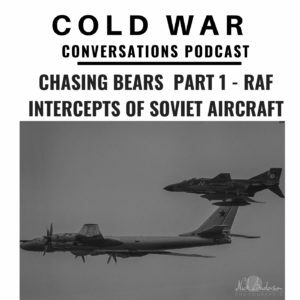 We also talk about how QRA (Quick Reaction Alert) worked and hear details of a number of missions Nick flew intercepting the Soviet Tupolev Tu-95 codenamed “The Bear” by NATO. Before we start the episode I wanted to thanks everyone who is supporting the podcast financially via Patreon and one off donations. including our latest supporters William Wallace, Peter Ryan, George Foster and James Chilcott. Now some of you may not realise that this podcast is a one man band and the podcast is financed out of my own pocket. When I started this in March 2018 I had no idea how popular this was going to be and have been astonished by the interest, your feedback and the generosity of my guests in allowing me to share their stories. Now back to today’s episode. We start out by describing the Phantom itself, and it’s difference from the US version.